In communities across the country including Boston, women cannot afford monthly feminine product necessities and underwear. Unlike many other necessities, pads and tampons are not covered by Food Stamps (SNAP Benefits), despite being expensive and needed monthly for many years. Women are left with too little or no options to provide for personal hygiene and comfort. We strive to restore a sense of dignity to our guests by greeting them with unconditional love, offering immediate support, and providing them with these necessities. That’s why we are excited to continue our partnership with Dignity Matters, a local organization that collects and supplies feminine hygiene products and underwear to women and girls who are homeless or otherwise in need, to help them stay healthy, regain self-confidence, and live with basic dignity. Our guests live on low or no income, so to not worry about having feminine hygiene care products relieves stress and promotes dignity. 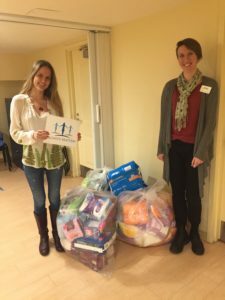 In 2017, Dignity Matters donated $10,852 worth of feminine hygiene products to WLP and provided these essential products to 100 women in our community each month. “We are grateful for our nonprofit partners that donate goods, food and services to help us meet the needs of over 1,400 women experiencing poverty or homelessness,” said Maritza Rosario, WLP Shelter Manager. In addition to offering necessities, Dignity Matters hosts ‘Bra Events’ at the shelter, private bra fittings that ensure women are wearing the right size and feel comfortable and confident. For more information about Dignity Matters, its programs, and ways to get involved, visit www.dignity-matters.org.